Posted by admin on February 24, 2015; This entry is filed under Articles. Growing up I ran track and cross country and in college I started lifting weights as well. I had horses out in my country home in West Virginia and we had two basic gears walk (past the neighbors’ houses so they didn’t call my mom and complain) and gallop everywhere else. Getting ready to run a 200 or 400m dash as you’re in position on the track, you are in a ball preparing to explode “on you mark, get set, GO.” On the bench getting ready for a new max on the bench press you breathe a couple times, look at your spotter and then make an explosive effort to push the weight. Dressage riding is the very opposite of this feeling and effort. It is about creating positive tension in your core muscles to create stability and still be fluid in your body. You are learning to direct the flow of yours and the horse’s energy to create something beautiful. When flying an airplane we do learn energy management during aerobatic flight, controlled descents but these techniques in flying are more about conserving energy. Maybe that could be an element of dressage, conserving energy to make the higher level movements with less force and more finesse; I’ll have to think about it. In my ride today on Donzer we made his neck longer. I have the leather pieces on my reins so I lengthened my reins another notch (about 3 inches) on purpose. For most of the lesson my brain was screaming at me to just shorten the reins a little bit, everything would be so much better if we could just take a little hold. It reminded me of the feeling you get at the swimming pool when you’ve tried to see how long you can hold your breath under water and the point when your brain starts screaming for oxygen. If you can wait through the initial panic, you get a few more seconds before you must have air. We were able to have this lesson because we’ve done the previous lessons using lateral movement and aids to control speed and balance (see previous posts). 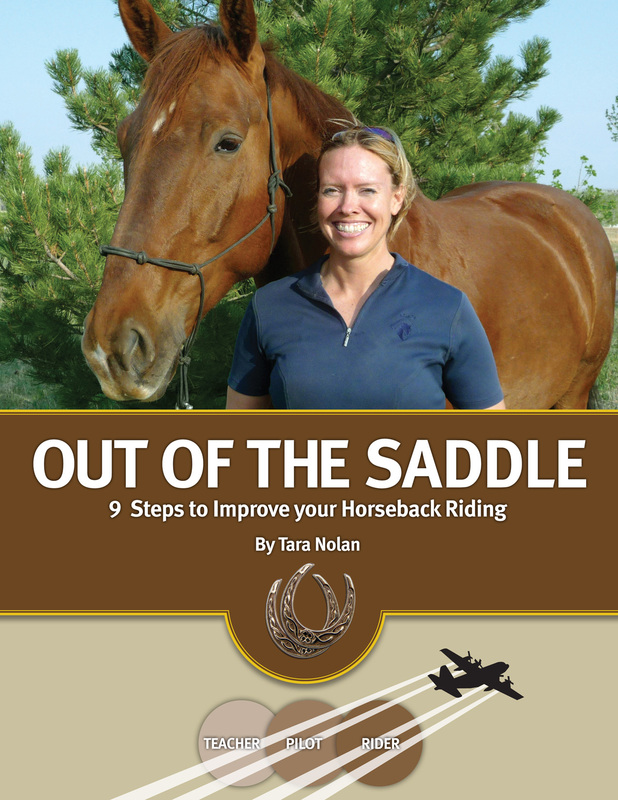 From my perspective in the saddle: I lengthened the reins and positioned my hands in front of the saddle and going to the right there was absolutely no connection to my outside (left) rein. Donzer was tipping onto the forehand and inching up his speed away from our nicer cadence. And, I was not allowed to pull back. Here begins the feeling of being underwater and needing air. From the instructor’s perspective: Donzer has a very short neck to begin with and when the reins are too short, this is accentuated. The current dynamic of motion is that Donzer has a short neck, is dropped in his withers and takes short steps with his hind legs because biomechanically this is what must happen. The first thing the rider must do is lengthen the reins and then the lesson commences. The Lesson: With the longer reins the overall goal was to have Donzer activate the muscles over the top of his back and neck. This would result in him lifting up his withers and shoulders. This would allow the front legs to move forward more freely and allow room for the hind legs to step more under. The hind legs stepping more under (think between the front legs) lowers the hind quarters and allows the shoulders to lift so the cycle of energy begins. A big part of the process is developing the strength to use all these new muscles. If you’ve ever been to the gym you understand workout programs, repetitions, sets of work—this all applies to the horse’s physical development as well. This is a fine goal and more difficult to execute. We used the lateral exercises we’d been practicing to encourage Donzer to reach for the bit. This is a process that just takes the time it’s going to take. My first dressage instructor, Michie Cavouti, would always say “TTT.” Things Take Time. When Donzer was starting to rush off and fall onto his forehand, what he’s done over and over, I used the counter bend and leg yield exercise to encourage Donzer’s inside hind leg to step more forward and across (engage). This resulted in Donzer slowing down and rebalancing. I can tell you that every few times I asked, Donzer would blow me off, and I would have to use my spur and niggle his side and say really, I need you to move this leg over. It’s also become apparent that half-halts are very optional in Donzer’s world so I need to be diligent and bring Donzer back to the halt if I ask for a half-halt and do not get a response. This is not a punishment or done out of frustration, it is a hole in my training that I need to go back and show Donzer what my expectation is, until Donzer believes it. One of my new topics with Donzer is continuous effort. Donzer responds to an aid, like moving his ribs over, and then lets his ribs move right back against my leg. To this point I’ve been happy to get the initial response and have not worked to maintain the ribs staying over. This is the next stage of my development as a rider—sustainment versus just a correct initial response. So Donzer went through the normal assortment of evasions. He tried to speed up and I used the lateral to control the speed. I did some leg yield, counter bend leg yield, haunches in, spiral in and out playing with the different tools to see what worked. Once I had the speed under control, Donzer moved on to sucking back behind my leg. This is a challenging evasion because you have to push the hind leg forward into a bigger step, not faster and the response Donzer wanted to give was faster. This starts the previous cycle over to use lateral work to control the speed and then still insist on forward (not faster). This phenomenon happens when you’re learning to land an airplane and you’re always too something (fast, slow, high, low, left, right, crooked and so on…) and quickly move from one extreme to the next so everything is a moving part. 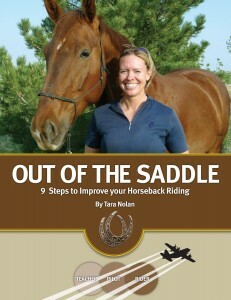 This is an ugly but necessary part of learning to fly and I see it is also part of “riding” your horse. I am going to assume that like flying, you get better at it. The final difficult evasion Donzer has always had is ducking behind the vertical. This has been put into the category of not being active enough behind. I am using this ducking as a signal that the hind leg needs to be re-energized to step more under or across. And, depending on how committed Donzer is to ducking, I may need to half-halt (or full halt) and then push forward. My theory is that I can just play with all these tools and start to feel what works with Donzer. Luckily I also have Ava and can see what works with her. I’ve already found I use the similar tools with each horse but they have different favorite evasions. The result of the lesson: By the end of the lesson I had Donzer working with a connection into this longer length of rein. It took some walk trot transitions to seal the deal on contact with the left rein. We were able to canter as well with the contact. From the saddle Donzer’s shoulders in front of my saddle lifted up and the trapezius muscle engaged from just in front of my saddle to about the middle of Donzer’s neck. This will be our work until Donzer accepts this is the new place of balance. This will be my work to stick with it until my muscle memory also seeks this balance with Donzer.